Lately it seems like the gods are making sure that there’s always a steady stream of news coming out about Penn State. 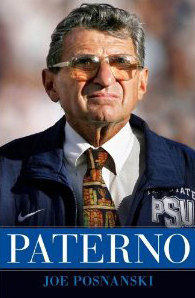 And I think we already know what next week’s news will be: Paterno, the new biography by Joe Posnanski. It’s due to hit bookstores on Tuesday. There’s a fair amount of anticipation around the book’s release (it’s already No. 28 on the Amazon.com top-sellers list, for example) and in large part that’s because of the circumstances: Posnanski set out to write a biography of Joe several years back, long before anyone knew what was to come, and suddenly last November Joe Paterno was out of a job and the nature of the book changed completely. There was a time earlier this summer when a lot of people questioned whether the book even mattered anymore. The release of the Freeh report—which harshly criticizes Paterno for not doing more to stop Jerry Sandusky from abusing young boys—didn’t help. A July 22 New York Times story called the biography “perhaps one of the most unfortunately timed books of 2012” and said it would “enter the marketplace at a moment when the name of Joe Paterno … has gone from revered to radioactive.” Posnanski’s book tour was cancelled, and now you can’t even find an official website for the book. Also on Wednesday, GQ magazine released some teensy tiny excerpts from the book—a grand total of 500 words’ worth. You can read those here. (And what the heck is Paterno, an avowed luddite, holding in that illustration? An iPhone?) Those are teasers from a longer excerpt that’s available in the September edition of GQ, which is on newsstands now. StateCollege.com’s Nate Mink ’11 bought a copy of the magazine and has posted a story about it, and Dustin Hockensmith ’04 of PennLive.com has a story as well. Entry filed under: Uncategorized. Tags: Dustin Hockensmith, Joe Posnanski, Nate Mink.